Steve Harwell, lead singer from Smash Mouth, I am begging you. Please, eat the eggs. Eat all the eggs up. 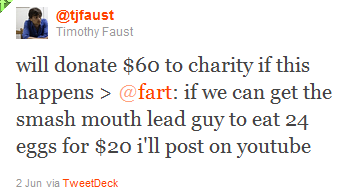 I will give the lead man from Smash Mouth $20 if he lets me film him eating 24 eggs. 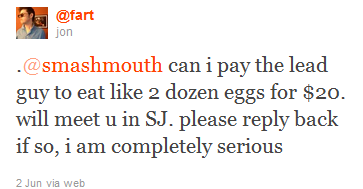 I want to go to San Jose and film him eating the eggs and put it on YouTube so we can all watch it. Smash Mouth, the eggs are free. I will give you two dozen free eggs. Free of charge eggs, Steve Harwell. I just want to film it. I just want to watch you eat a bunch of eggs. Please. I'm completely serious, Steve. I will cook the eggs however you want. Just want to fill your belly up with 24 eggs. Do you want those more expensive brown eggs? I'll get you the brown eggs. Eat as many as you can! I will drive down from Redwood City and film you eating the eggs. Please. A lot of other people want to see it too. 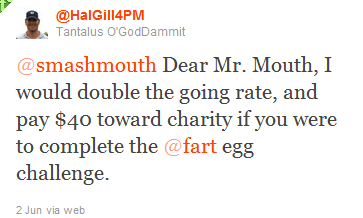 I will film you in HD and put it on YouTube and everyone can enjoy your Egg Fun. You can talk about your new music hits during the Egg Feast if you want. Talk about anything. Just want your Smash Mouth filled up with eggy bits. Really badly, we want this. How do you like your eggs? I imagined hard-boiled eggs but you can have them any way you want. Just eat 'em on the cam! It's OK to be a sloppy man, put the eggs in! That's all we want, the eggs in your mouth hole. Please, eat the eggs. A lot of money pledges are coming in, Mr. Mouth. Please, don't egg-nore this. Just eat the eggs. This is completely serious. You just have to eat a bunch of eggs, that's it. It's just eggs! Contact me, Smash Mouth. We can meet in a park on a sunny day, and I'll bring all the eggs. Let's meet at that park at First and St. John in San Jose. The one with the homeless people that invade at night. They're not out during the day, though. We'll chat for a minute and then the munch can start! Two dozen hot eggs, all for you, and for free. Free eggs, just say the word! NO ONE CAN HELP STEVE EAT THE EGGS! Sorry bandmates, I know you are a team, but this is a one-man Egg Bounty. We just want to see him. We have all been talking it over, and we think he can really put away some bigtime eggs. Let's see if he can do it. A lot of money is at stake. This is a real thing, this is not a joke. I will watch you eat the eggs, but in a kind and respectful way. Fill your entire body up with eggs for us, Smash Mouth. I'm so serious. 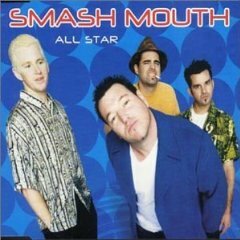 Smash Mouth, contact me. There are hundreds more people saying these things. I will film you eating 24 eggs. Please. Please eat the eggs.